​If you are interested in extending the growing season as well as safeguarding young plants, you might be interested in purchasing a cold frame greenhouse. While many experienced gardeners will opt for large polycarbonate greenhouses with advanced technological features that include venting and heating abilities, a cold frame greenhouse is a cheaper & smaller alternative. What is a cold frame greenhouse? A cold frame greenhouse is relatively small greenhouse structure with four sides, that is low to the ground, with a transparent top that enables the sun to get inside and warm plants during cold weather. Many do-it-yourself professionals have no trouble building cold frame greenhouses from recycled and available materials on their farmyard, but they're also available online for purchase as kits. Let's take a look at 5 of the best-selling cold frame greenhouses on the market today. In terms of its structure, a cold frame greenhouse will have sidewalls that are slanted which enables it to discard rain, snow and other types of debris, which helps keep the sun shining on the plants inside of it through the top panel. The slanted sides are an intelligent design feature because besides it sliding off debris it also allows maximum exposure to sun even later in the day as it is beginning to set. When setting up your cold frame greenhouse it's important to position it so that it faces the south- this allows for the most sun exposure. You should also be careful not to install your cold frame greenhouse beneath a tree, or a barn, or any other structure that could cast shade and prevent its access to fresh sunlight. Sometimes gardeners and farmers will install their cold frame greenhouses on the side of a house or garage that faces the south-this means that the wall of the structure while act as a rear backstop for the cold frame. As well, if that building has heat it will mean that some of it will transfer to the cold frame enclosure which is a nice way of adding some warmth during the colder seasons. Most of the time the cold frame will be kept shut so that all the stored up heat will not escape when it's cold outside. However, when it is warmer, it's important to open up the top transparent lid every so often so that the plants and seedlings inside do not become overheated. Another important consideration when placing your cold frame greenhouse in your yard or farm is to ensure that it is situated in an area with sufficient irrigation- you don't want it to get flooded and cause all the plants inside to drown. Many experienced gardeners will make use of these nifty little miniature greenhouses during the autumn months as an extension of the summer growing season. It's a great way to get some more growing opportunities while the temperature falls and continue to harvest root crops, salad greens as well as herbs in the colder months. During the later winter months and progressing into the early spring prior to the last freeze of the season, these miniature greenhouses can be used to begin cultivating annual plant seeds, hardening off and blooming sensitive seedlings that initially began being cultivated indoors. One handy tip if you are growing in a particularly cold climate used to sometimes covers the cold frame clean house enclosure in hay or a blanket when it gets especially cold. While many craftsmen can easily build a cold frame greenhouse from recycled materials, that's not so easy for everyone. 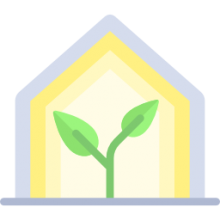 Consider purchasing a cold frame clean house kit and installing it on your property if you are interested in this method of plant cultivation.